Sunday 10th December. A cold, nay Freezing, wet day, with occasional patches of Slush under Tyre or foot, saw 10 Cyclists brave enough to leave via Lower Marsh, Berrylands, New Malden, Malden Manor, Worcester park, West Ewell, Bonesgate path, Chessington, (now ahead of Schedule, after earlier taking a short cut), Claygate, Hinchley Wood to Thames Ditton for a very welcome lunch at ‘the Angel Inn’, (with very heavy snow now falling outside, we were also joined by 10 other Cyclists, who didn’t brave the wintery conditions). After Bai said a few words thanking our Leader(s) for the Rides this Year, also thanks to John D & Derek for all the Bread Puddings throughout the Year, Roger then said thank-you to all the ‘Support Riders, be they Back Marker, Corner Marker, Ride Leader or even E Bike carrier, (down the stairs at Brondesbury Park Station), a new award for ‘Ride Supporter’ of the Year was given to John E for all his Back marking on Rides over the Year. With many deciding to head for Home, 4 Cyclists continued via Weston Green, East Molesey, Hampton Court Bridge, Bushy Park, Hampton Hill to Fulwell for Tea & Cookies with Mince Pies, then Teddington, Hampton Wick & Kingston Bridge. Total 21 Miles, 1 new face, thanks to Jon W for back marking, also thanks to John E and Steve & Therese for the Mince Pies, thanks to Roger for the Cookies. Sunday 26th November, part 1. A bright but cold day saw 17 Cyclists leave via Kingston Bridge, Bushy Park, ( including a small detour to avoid the fun runners, -unsuccessfully), Hampton, pausing briefly to visit the site of a tribute to ‘General Roy’, Grandfather of Ordnance Survey Maps, Hanworth, -where a visit from the ‘P fairy’, caused a small delay-, Hanworth Park, River Crane Path, to Twickenham, for lunch at the ‘Prince Blucher’, then Strawberry Hill, Teddington, a very congested Hampton Wick, Kingston Bridge. Total 13 Miles, 1 new Face, 1 ‘P’. Sunday 12th November, a bright but chilly day saw 26 Cyclists leave via Lower Marsh, Berrylands, pausing for the ‘2 minute silence’, to remember the fallen Tolworth Greenway, West Ewell, Clarendon Park, Ashtead Common, Leatherhead, Fetcham, Bookham, to Effingham for lunch at ‘the Sir Douglas Haig’, with estimates of 45 Mins. to an Hour predicted for Food, some elected to make do with Crisps, while others where willing to wait, for most people food arrived 30 to 40 minutes after ordering, then Effingham Junction, Martyr’s Green, Hatchford, Cobham, Fairmile, Portsmouth Rd to Claremont Gardens -with reduced Cycle Parking 😦 – for Tea & BP, then Esher, Littleworth, Hinchley Wood, Long Ditton, Surbiton to Kingston. Total 28 Miles, 2 new Faces, Thanks once again to John E for back marking & Chain remounting, many others for corner marking, and special thanks to Derek for the Bread Pudding. Sunday 22nd October, A mostly bright day, with a strong (at times very strong) Headwind, saw 27 Cyclists leave via the Portsmouth Rd Track, Thames Ditton, Hinchley Wood, Esher, Fairmile, Cobham, Hatchford, Ockham, to Send Marsh for lunch at the ‘Saddlers arms’, then Newark, Pyrford, West Byfleet, Byfleet, Brooklands Community Park, Weybridge, Burwood Park, to Hersham Garden centre, for Tea & BP, then Hersham, Walton, Esher, Weston Green, Giggshill Green, Portsmouth Rd to Kingston. Total 32 Miles, 7 new faces, thanks to Jon & Mike for back marking & many others for corner marking. 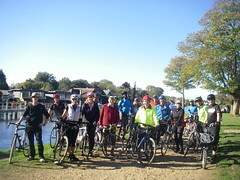 Sunday 8th October, a mostly bright day saw 25 Cyclists leave via Kingston Bridge, Bushy Park, Hampton, Hanworth, Feltham, East Bedfont, Stanwell, Stanwellmoor, Poyle, Horton, Datchet, Jubilee River path, (with many runners enjoying the Windsor Marathon), to Dorney for lunch at the ‘Pineapple’, sadly a very long 1.5 Hour wait for the food, together with malfunctioning gents loo mean it’s very unlikely we’ll be back anytime soon, so a delayed departure via the footbridge to Monkey Island, Fifield, Cranbourne, Woodside, Cheapside, Blacknest gate of Windsor great Park, to Virginia Water Cafe for an earlier than planned Tea & BP, then Virginia Water village, Lyne, Addlestone, Victory Park, Weybridge, Weybridge Park, Oatlands, Walton on Thames, Esher, Weston Green, Giggshill Green, Portsmouth Rd track to Kingston. Total 48 Miles, thanks to John E once again for back marking & many others for corner marking and thanks to John D for the Bread Pudding. Sunday 24th September, Part 1. 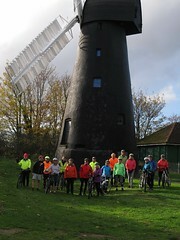 A bright Sunny day saw 20 Cyclists leave via Lower Marsh, Berrylands, New Malden, Motspur park, Joseph Hood Park, North Cheam, Cheam Park, Nonsuch Park busy with ‘Poppy Walkers’, & Joggers, Stoneleigh, West Ewell, Horton Country Park to Chessington for Lunch at the ‘William Bourne’, then the Bonesgate Path, Tolworth, Surbiton to Kingston. Sub total 17 Miles, 4 new faces, thanks to Jon W for back marking & others for marking corners. Part 2. With increasing Cloud, we said farewell to 12 and hello to 5, fresh faces so 13 Cyclists left via the Portsmouth Rd track, Giggshill Green, Weston Green, Esher, Walton on Thames, Ashley Park, (with 1 very annoyed Motorist), Thames Towpath, to Molesey for Tea & BP at Molesey Cricket Club, more Towpath, a very congested Hampton Court Bridge, Bushy Park, Kingston Bridge, to Kingston. Sub total 15Miles, Total for the day, 32 Miles, 2 new Faces, thanks to Derek for back marking & many others for marking corners, also thanks to John for the Bread Pudding. Sunday 10th September. A bright morning, with some light drizzle, and some gusty Wind later in the day, saw 20 Cyclists leave via the Portsmouth Rd track, Long Ditton, Giggshill Green, Weston Green, Esher, Walton park, Walton on Thames, Weybridge, Brooklands Park, Byfleet, Wey Navigation, Pyrford, Woking, Goldsworth Park, -where our Leader claims he was distracted by a ‘lost sheep’, who wasn’t really lost at all, but in truth he should have been paying more attention-, 2 yes two wrong cul-de-sac’s, before the right path was found to Knaphill for lunch at ‘the Royal Oak’, with a slight delay for some of the grub, then Chobham, Dunstall green, where a large Pothole, caused a visit from the ‘P fairy’, Homewood Park, Bretlands, Addlestone & Victory Park, Portmore Park to Walton Bridge for Tea & BP at Gino’s, then Walton , Molesey, Thames Ditton Portsmouth Rd track to Kingston. Total 40 Miles, 1 new face. Thanks to John E for back marking duties, & others, especially Jon W for marking corners, thanks also to John D for the Bread Pudding. Alas the Camera failed to record the picture from Homewood Park. Thanks to Tracey for her Photo’s. Wednesday 6th September, a largely bright Evening saw 12 Cyclists leave passing the Road closure at Skerne Rd, to the Aerospace estate, Ham, Ham House, Thames towpath, Richmond, Richmond Bridge, St Margerets, to Twickenham, (including another Road closure), for refreshments at the ‘Sussex arms’, then Strawberry Hill, Teddington, Hampton Wick & Kingston Bridge. Total 11 Miles, 1 new Face. Thanks to John E & Jon W for back marking duties. Sunday 20th August. A mostly bright day, with increasing cloud in the afternoon, saw 22 Cyclists leave via Kingston Bridge, Bushy Park, (& a 10Km ‘fun run’), Hampton, Hanworth, lower Feltham, Ashford, Knowle Green, Staines, Staines Bridge, -with an advance party missing a turn-, (me thinks the leader forgot to forewarn them), Egham, to Englefield Green for lunch at the ‘Barley Mow’, (with a somewhat confusing ordering & payment system :-p), then Bishopsgate of Windsor great Park, Savill Garden, Virginia Water lake, Virginia Water village, Lyne, St Ann’s Hill, Chertsey, -with a missing Footbridge causing a small detour-, Chertsey Mead, Chertsey Bridge, Shepperton, to Upper Haliford for Tea & BP at Squires Garden centre, then Sunbury, Hampton, Dukes Head gate of Bushy Park, to Church grove, Kingston Bridge. Total 35 Miles, 3 new Faces. Thanks to Steve D & Mike for sharing the Back marking duties, thanks as always to John for the Bread Pudding. Sunday 6th August. A largely bright day saw 16 Cyclists gather at Tolworth Station, (including 4 people coming on the feeder ride from Berrylands, as there where no trains on the Chessington line), leave via West Ewell, Epsom, Langley Vale, Headley, Betchworth, Gadbrook, Parkgate, to Newdigate for lunch at the ‘Six Bells’- with a little bit of confusion over 1 order & 1 order having a late delivery-, then a minor Brake adjustment, helping to cause 3 ‘lost Sheep’ ;-(, all back together, via Henfold, North Holmwood, Dorking, Dorking Rec, Burford Bridge, Norbury Park Farm, to Bocketts Farm for Tea & BP, with the most valuable Cyclist, (the Baker of the BP), suffering a visit from the P fairy, swiftly repaired, then Leatherhead, (where a stray Branch almost stole a pair of Sunglasses), Ashtead Common, Epsom Common, Long Grove Park, Hogsmill path, Tolworth, Berrylands to Kingston. Total 44 Miles, 2 new Faces. Thanks to John E for back marking, many others for watching corners, & John D for the Bread Pudding. Sunday 23rd July, a mostly overcast day, with 1 very light Shower of rain, saw 10 Cyclists leave via Canbury Gardens, Lower Ham, Aerospace Estate, Ham, Ham gate of Richmond Park to Sheen Gate, Mortlake, Chiswick Bridge, Chiswick, South Acton, Ealing Common, Ealing, Pitshanger Park, Perivale, Grand Union Canal Towpath to Greenford for lunch at ‘the Black Horse’, then more Towpath to Southall, (encountering an Uxbridge Cycling group), Norwood Green, to Osterley Park for Tea & BP, then Osterley, Isleworth, Twickenham, Strawberry Hill, Teddington, Hampton Wick, Kingston Bridge. Total 31 Miles. Thanks to Mike & Jon for sharing Back marking duties, thanks to John for the succulent Bread Pudding. Sunday 9th July. A mostly bright day saw 7 Cyclists gather at Clapham Junction, for the Overground train to Hoxton, where 15 more where waiting, so 22 Cyclists left via Hoxton, Victoria Park, Hertford Union Canal towpath, the Queen Elizabeth Olympic Park, Leyton, to Walthamstow to see some of the improvements that Waltham Forest Council have used there share of ‘Mini Holland’ money from the Mayor of London, then the Lea Navigation Towpath, to Tottenham Hale for lunch at ‘the Ferry Boat Inn, then Tottenham, Downhills Park, Wood Green, where Road Closed signs led to a small detour due to the ‘Red Bull Soapbox’ event taking place on our intended Route, through Alexandra Park 😦, Muswell Hill, Fortis Green, East Finchley, Hampstead Garden Suburb, Golders Green, Hampstead Cemetery, Fortune Green, Brondesbury, (where 1 of our party needed assistance down to the Platform for an early Train, so extra ‘Brownie points to Jon), to Queens Park for Tea & BP, then Kensal Town, with a Street party meaning a dismount to walk passed the stage, to North Kensington, where we paused briefly to reflect on the ‘Grenfell Tower’ tragedy of a few weeks ago, then Shepherd’s Bush, Brook Green, Baron’s Court, Hammersmith Bridge, Barnes, Roehampton Gate of Richmond Park, Kingston Gate to Kingston. Total 38 Miles, 2 new Faces. Thanks to John E for Back Marking & many others for watching corners, & special thanks to John D for going the extra Mile to deliver the Bread pudding, despite not joining us because of other commitments. Wednesday 21st June, on the Hottest June day for 40+ Years, and having missed ‘Bike Week’ due to an admin. mix up, (although you could argue it was the BW organisers who went early, missing Mid Summers day), 6 Cyclists left via Kingston Bridge, Bushy Park, Fulwell, River Crane path, Twickenham, Cole park, St. Margerets, Richmond Bridge to Richmond Hill for well earned refreshments at ‘the Roebuck’, also meeting many other familiar Faces, admiring a fantastic Sunset, then Richmond Park, with just a few Deer for company, ( & a few other Cyclists) to Kingston Gate, where everyone went there seperate ways. 12 Miles, 1 new Face, thanks to Ralph for Back marking. Sunday 18th June. 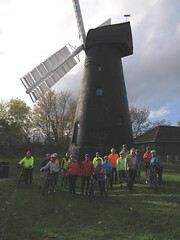 A bright & Sultry day saw 14 Cyclists ready for Part 1, leave via, Surbiton, Long Ditton, Hinchley Wood, (where the Leader had a visit from the ‘P Fairy’, swiftly repaired), Littleworth Common, Esher, to East Molesey for an early Lunch at ‘the Bell’, then Thames Ditton, Portsmouth Rd track to Kingston. Total 12 Miles, 1 Puncture. Part 2 Still quite Steamy we said farewell to 5, hello to 4, so 13 Cyclists, were ready for the off, (but 1st a faulty valve meant a Tube change), leave via Skerne Rd, Latchmere, Ham, Ham Gate of Richmond Park, to Petersham Gate, (where shortly after leaving the Park, 1 of our party helped a ‘Damsel in distress’, not of our party, replace a tube), Richmond, Richmond Bridge, Ducks Walk, where yet another visit from the P Fairy, (again swiftly fixed), Isleworth, Whitton, to Knellor Gardens for Tea & BP, then Twickenham, Teddington, Hampton Wick & Kingston Bridge to Kingston. Total 12 Miles, 1 Puncture. Thanks to Mick for Back marking (& Puncture repairs), many others for Marking corners, thanks to John for a superb Bread Pudding. Sunday 4th June. A mostly bright day saw 20 Cyclists leave via Lower Marsh, Berrylands, New Malden, Motspur park, Bushy Meads, Merton park, South Wimbledon, Colliers Wood, Tooting, Tooting Bec Common, Streatham Hill, Tulse Hill, Brockwell Park, to West Dulwich for lunch at ‘the Alleyns Head’ (where for some unexplained reason, no food could be served outdoors, so those wanting ‘Pub Grub’ ate indoors), then Dulwich Park, Greendale, Camberwell Grove, Peckham, Surrey Canal path, Burgess Park, Camberwell, Stockwell, to Clapham Common for Tea & BP, then shortly after leaving the Common, a momentary lapse in concentration by the leader led to a grazed Elbow, ;-( Wandsworth Common, Earlsfield, Wimbledon Park, Wimbledon Village, Copse Hill, Malden Golf course, Mount Pleasant, Norbiton to Kingston. Total 34 Miles, thanks to Bob & Mike for Back-marking duties, and others for corner marking, thanks to John for the Bread Pudding. Sunday 21st May. A bright Sunny day, with the ‘usual Leader’ having a day off, welcome a new Leader, Jon, with 21 Cyclists, leave via Eden St., Surbiton, Long Ditton, Giggshill Green, Weston Green, Esher, Walton on Thames, Thames Towpath to Weybridge, (where the BP man almost made a break for freedom), Brooklands community Park, Byfleet, Wey Navigation Canal Towpath to Pyrford Lock for lunch at ‘the Anchor’, then Wisley, Ockham, Martyr’s Green, Hatchford, Downside, Stoke D’Abernon, Cobham, Fairmile, Stokesheath, Claygate to Long Ditton for Tea & BP at ‘Squires Garden Centre’, then Seething Wells, Portsmouth Rd track to Kingston. Total 33 Miles, 1 new face. Thanks to Steve J for back marking, many others for marking corners & JD for the Bread Pudding, and special thanks to Jon for leading a novel route to a familiar destination. Sunday 7th May, A largely cloudy Morning saw 23 Cyclists remember the early start at New Malden, leaving via Motspur park, Cannons Hill, Morden, Morden Hall Park, Mitcham, Thornton Heath, Selhurst, South Norwood Park, Elmers End, Clock House, Cator Park, Beckenham, Sundridge, Elmstead to Chislehurst for lunch at the ‘Queens Head’, with a small group opting for the local Cafe, both with excellent service, then with brighter Skies & some Sunshine, Chislehurst Common, an almost missed turn to Jubilee Country Park, Southborough, Norman Park, Pickhurst, West Wickham, Spring park, Shirley, Addiscombe, Woodside, Selhurst (again), West Croydon to Wandle Park, for Tea & BP, then a short stretch of the Wandle trail, Beddington, Beddington Park, Hackbridge, Benhilton, Pylbrook path, Trafalgar path, a newly surfaced path to Sir Joseph Hood Park, Motspur Park to New Malden. Total 44 Miles, 3 new Faces. thanks to Steve for back marking, many others for marking corners, thanks to John for the Bread Pudding and special thanks to Mike for showing me most of this route. Also thanks to Tracey for the Photo. Sunday 23rd April, a mostly bright St Georges day saw 25 Cyclists leave via Kingston Bridge, Church Grove path, Bushy Park, to Hampton, Fulwell, River Crane -just a trickle after a long dry spell -path, Whitton, Isleworth, Osterley, Osterley Park, Norwood green, Grand Union Canal towpath to Hanwell for lunch at the always fabulous Fox, then Hanwell, Churchfield Park, Drayton Green, West Ealing, Hanger Hill, West Acton, Acton Town, South Acton, Chiswick Park, Chiswick green, Grove Park, Chiswick Bridge, Mortlake, East Sheen to Palewell Common for Tea & BP and free Pizza for some, then Sheen gate Richmond Park, to Ham gate, Latchmere, to Kingston. Total 28 Miles, 1 new face. Wednesday 19th April, a bright but chilly Evening saw 10 Cyclists leave on the first Evening ride of 2017 via Kingston Bridge, Thames towpath to Hampton Court, Molesey, Esher to Claygate, (with a small contingent taking a different final approach), for refreshments at ‘the Griffin’, then Hinchley Wood, Long Ditton, Surbiton, to Kingston. Total 12 Miles. Sunday 9th April, a Glorious warm & Sunny day saw 34 Cyclists, yes Thirty Four leave via Kingston Bridge, (where a jammed Chain caused a small delay), Bushy Park, Hampton, Hanworth, Feltham, Bedfont, Stanwell, Stanwell Moor, Poyle to Wraysbury for a ‘Split lunch’ at the ‘Perseverance’ & the ‘George’, very good service at both establishments, afterwards, Hythe end, Staines, Staines Bridge, Egham Hythe, Thorpe, Chertsey, Chertsey Bridge, Shepperton, (where a broken Bottle of Mayonnaise, caused an unplanned dismount, but no lasting damage), Walton Bridge to an already busy ‘Gino’s’ for Tea & BP, then some ‘miscommunication’ led some to take the Towpath, Walton, Molesey, Thames Ditton route, while the main party, took the alternative Walton, Esher, Thames Ditton route, then Portsmouth Rd track to Kingston. Total 33 Miles, 5 new faces. Thanks to Bob for back-marking, & many others for marking corners, thanks to John for the Bread Pudding & thanks to Tracey for the Photo’s. Sunday 19th March. Part 1, a strong blustery Wind had not deterred the 26 Cyclists, so via Lower Marsh, Berrylands, New Malden, Malden Golf course, Copse Hill, Wimbledon Common, – with an encounter with the ‘Marsden March‘,- a 14 Mile sponsored Walk between the 2 main parts of the Royal Marsden Hospital, Fulham & Sutton,- Putney Heath, Roehampton, Barnes Common to Barnes for Lunch at ‘the Red Lion’, with a small party prefering a local Cafe, then Barnes Village, traffic free Level Crossings Vine Road, Roehampton gate Richmond Park, with a strong Headwind making the last Mile seem like 10 Miles, Kingston gate to Kingston. Total 16 Miles, 4 new Faces. Thanks to Bai for Back marking, & many others for watching corners. Part 2, Saying farewell to 15, but welcoming 3 fresh faces, 14 Cyclists left via Canbury Gardens, Thames Towpath, Aerospace estate, Ham, Ham gate Richmond Park, Petersham gate, Richmond, Richmond Bridge, Duck’s walk, St Margerets, to Marble Hill House, for Tea & BP, then Twickenham Riverside, Twickenham, Strawberry Hill, Teddington, Hampton Wick, Kingston Bridge to Kingston. Sub total 11 Miles, Total 28 Miles. Thanks to Steve for Back marking duties & thanks to John for the Breadpudding. Sunday 5th March. With a somewhat damp forecast, it was a pleasant surprise to see the Sun at the start, but would it last, so 9 Chaps, (all the Ladies perhaps where put off by the Forecast), left via Kingston Bridge, Bushy Park, Hampton, Fulwell, River Crane path, Whitton, Isleworth, Osterley, Osterley Park, Norwood Green, Southall, Greenford to Northolt – with 1 brief Shower, approaching Northolt-, for Lunch at ‘the Crown’, afterwards, still with some Sun, but also a couple of heavy Showers, the Grand Union Canal towpath to Perivale, alas we had lost 1 member of the party, after a few calls it was established that Iyad had felt Dizzy, so the Leader retraced the route, then found an alternative route away from the Canal, regrouping in Perivale, then Pitshanger Park, Hanger Hill, West Acton, Acton, Acton Park for Tea & a ‘special’ BP to celebrate our Leaders Birthday, followed by a sharp Hale Shower, Acton Green, Chiswick Green, Grove park, Chiswick Bridge, Mortlake, Sheen gate Richmond Park, with a strong Headwind to complete the weather full house, to Kingston Gate, Kingston. Total 31 Miles. Thanks to Chris for Back marking duties & John for the ‘Birthday’ Bread pudding. Sunday 26th February. With the usual Leader feeling the after effects from a nasty spill, thanks to Mike for offering a ‘novel route’, so with a mostly cloudy day , 16 Cyclists, left via Lower Marsh, Berrylands, New Malden, Worcester Park, North Cheam, Sutton, Carshalton, Carshalton Park, Stanley Park, Oaks Park, to Woodmansterne for lunch at ‘the Woodman’, then with a strong Blustery Headwind via Banstead, Burgh Heath, Tattenham corner, Epsom, the ‘Nescot path’, East Ewell, to Nonsuch Park for Tea & BP, Stoneleigh, Worcester Park, New Malden, Berrylands, to Kingston. Total 28 Miles, Thanks to Mike for leading, John E for Back marking & John D for the Bread Pudding. Sunday 12th February, a not quite Frozen, cloudy day, saw 15 Cyclists leave via Kingston Bridge, Bushy Park, Hampton, Lower Sunbury, Halliford, Shepperton, Chertsey Bridge, where a slipped chain caused a false alarm, but by Addlestone, a visit from the ‘P fairy’ and the complications of Hub gears, meant an early departure for Steve, so with a new Back Marker selected, via Homewood Park, Stonehill, Dunstall Green, Coxhill Green, Horsell to Woking for Lunch at ‘the Herbert Wells’, (Wetherspoons), then after pausing for the Photo, via Maybury, Pyrford, Wey Navigation path, Byfleet, Brooklands Park, Weybridge, Burwood Park, to Hersham Garden Centre for Tea & BP, then Hersham, Esher, Weston Green, Giggshill Green, Portsmouth Rd to Kingston. Total 40 Miles, 1 new face, (from Watford), 1 Puncture. Thanks to Steve F & Andrea for Back marking duties and John for the Bread pudding. Sunday 29th January, with a light Shower of Drizzle stopping shortly after the start, a merry Dozen Cyclists left via Skerne Rd, Latchmere, Ham gate Richmond Park, to Roehampton gate, Barnes Common, Putney, Wandsworth, the Wandle Trail via Earlsfield & Summerstown, to Colliers Wood & Merton Abbey Mills for lunch at the ‘William Morris’, then more Wandle path, via Morden Hall Park, Ravensbury Park & Watermeads, but with Drizzle returning, a strategic shortcut was needed, so via the Wrythe, Rosehill to Lower Morden for Tea & BP at the ‘Wyevale Garden Centre’, then with heavier Drizzle, Morden Cemetery, Motspur park, New Malden, Berrylands to Kingston. Total 26 Miles, Thanks to Steve D for Back marking duties, and John for the Bread pudding. Sunday 15th January. a cold drizzly day saw 8 intrepid Cyclists willing to brave the conditions, leave via Kingston Bridge, Teddington, Strawberry Hill, Twickenham, St Margerets, Isleworth, Syon Park, Brentford, South Ealing, Ealing Common, West Acton, Park Royal, Grand union Canal Towpath to Harlesden for lunch at the ‘Grand Junction Arms’, then return to the Canal towpath to Ladbroke Grove, Shepherds Bush, Brook Green, Barons Court, Fulham to Bishops Park Cafe for Tea & BP, then Putney Bridge, Putney, Barnes Common, Roehampton gate of Richmond Park, White Lodge, Ham cross, Ham Gate, Latchmere to Kingston. Total 30 Miles, thanks to Kim for Back-marking & as always thanks to John for the Bread Pudding. A mostly bright day, with increasing cloud in the afternoon, saw 22 Cyclists leave via Kingston Bridge, Bushy Park, (& a 10Km ‘fun run’), Hampton, Hanworth, lower Feltham, Ashford, Knowle Green, Staines, Staines Bridge, -with an advance party missing a turn-, (me thinks the leader forgot to forewarn them), Egham, to Englefield Green for lunch at the ‘Barley Mow’, (with a somewhat confusing ordering & payment system :-p), then Bishopsgate of Windsor great Park, Savill Garden, Virginia Water lake, Virginia Water village, Lyne, St Ann’s Hill, Chertsey, -with a missing Footbridge causing a small detour-, Chertsey Mead, Chertsey Bridge, Shepperton, to Upper Haliford for Tea & BP at Squires Garden centre, then Sunbury, Hampton, Dukes Head gate of Bushy Park, to Church grove, Kingston Bridge. Total 35 Miles, 3 new Faces. Thanks to Steve D & Mike for sharing the Back marking duties, thanks as always to John for the Bread Pudding. Wednesday 16th August, a bright Evening saw 9 Cyclists leave via Lower Marsh, Berrylands, where a touch of Wheels led to a slip for the Leader,( but no injuries), New Malden, Malden Manor, with a pause to inflate a rear Tyre, Worcester park, (with a missed turn leading to a long forgotten path), Stoneleigh, Nonsuch Park, East Ewell, to Ewell Village for refreshments at ‘the Wheatsheaf’, then Hogsmill path, West Ewell, Tolworth, Berrylands, the Bittoms to Kingston. Total 15 Miles. Thanks to Jon for Back marking duties.